I spend a good deal of time inside a terminal. Text-based apps are powerful, when you know what you're doing, and fast (also when you know what you're doing, I suppose). 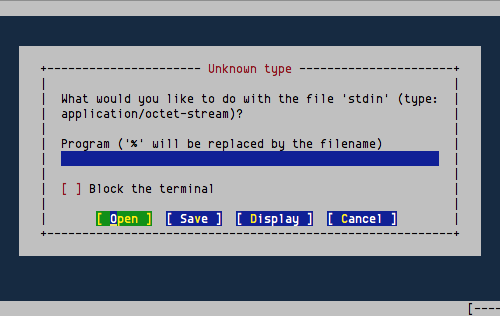 If an equivalent Cocoa or X11 GUI tool offers me little advantage, I'm probably going to stick to either a CLI- or TUI-based piece of software. One of the more important, taken-for-granted pieces of the command line environment is that of the pager. Typically, one would use something like more or less for their pager. For a while, I used w3m as my pager, as well as my text-based web browser. Then Snow Leopard came out, and everything from MacPorts got totally jacked up and left much of my system jacked up as well. Parts of it I've fixed, other parts I've been lazy about. For that reason, or perhaps not, I have transitioned to ELinks as my text-based web browser. Today, after recent discussions with a friend regarding w3m and ELinks, I had a thought - why not use ELinks as my pager as well? 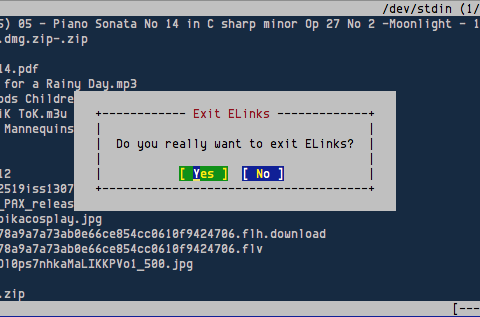 bind "main" "q" = "really-quit"
function ep -d "Use ELinks as pager"
…which allows me to use ep (ELinks pager) as an alias to running elinks with the pager.conf file loaded. Other shells (and, technically, fish as well) can achieve this with alias ep=elinks -config-file pager.conf. (I believe. Correct me if I'm wrong, it's been a while.) And with that, you have ls | ep for a nice, scroll-wheel-friendly pager. One unfortunate reality is that behavior is more like more than like less - the whole stdin needs to be read before the display is rendered. For very large listings, this is… unpleasant at best.